I am happy to report that Southwest Airlines fixed their gift card balance checker page. You can now type your Southwest Airlines gift card (or egift card) number and security code number (PIN) into the Southwest Airlines gift card balance checker and click the Check Now button. 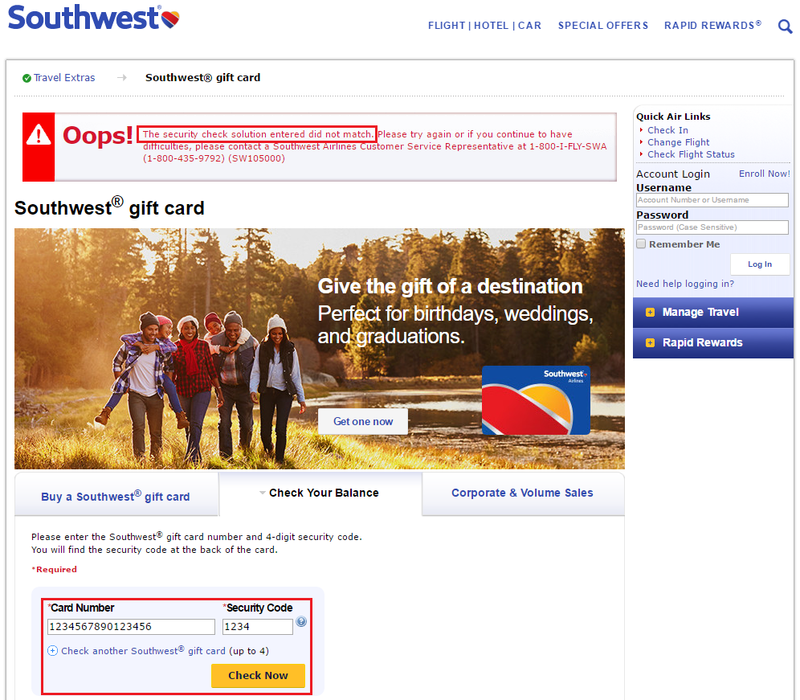 Luckily, you will now see your Southwest Airlines gift card (or egift card) balance on the next page. No more annoying error message or hidden CAPTCHA codes to deal with. Woo hoo, it only took Southwest Airlines more than a year to fix this problem. The alternative approach I recommended in the old Southwest Airlines gift card balance check blog post still works too. You have to go to the Southwest Airlines View Travel Funds page. From here, you can view the balance of your Southwest Airlines travel funds, Southwest Airlines LUV vouchers, and Southwest Airlines gift cards (and egift cards). Southwest Airlines also got rid of the CAPTCHA code on this page, even though it was working properly. I tested one of my Southwest Airlines travel funds and the balance checker worked fine. I’m very pleased that Southwest Airlines finally fixed their gift card balance checker. If you have any questions, please leave a comment below. Have a great day everyone! This entry was posted in Airlines + Miles, Promotions + Deals and tagged Award Travel, Southwest, Travel. grant, thx for info; btw, do u or any folks on here happen to know SW has any official policy that will extend travel fund that customer paid for (for a fee)? As far as I know, Southwest Airlines will not extend the expiration date of travel funds. You have to redeem and travel by the expiration date on the travel funds. Dang, that’s a steep fee. It might be worth it to some people. Have you ever done that? I don’t have that much SWA travel funds, but I do have a lot of SWA eGCs that I bought from eBay and directly to use up travel reimbursements on CCs. If you do extend the travel funds, let me know how the process goes. Do they take the value from the funds itself or do you have to pay the fee with a CC?